- Haroons, Blue Area, Islamabad. - Illusions, Jinnah Super, Islamabad. - CD Mela, Chaklala Scheme 3, Rawalpindi. Concert tickets will cost a meager Rs.600/- per person for outsiders. They’ll also be provided at multiple other famous locations in the twin cities, the list of these locations will be uploaded soon. Kindly buy tickets from the announced locations only to avoid fraud or black marketing. A separate area for ladies will also be available, along with the mixed crowd area. We'd also be hosting a selection of the most famous underground rock bands at the concert, a finalized list shall be uploaded soon. 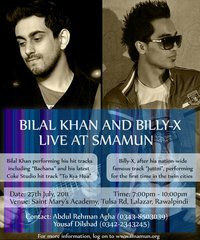 Bilal Khan and Billy X will be performing live at SMAMUN on 27th July, 2011. Bilal Khan will be performing many of his hit songs including "Bachana" and his recent coke studio hit "To Kya Hua". After his nation-wide hit "Juttni", Billy-X will be performing for the first time in the Rawalpindi/Islamabad region. He will be performing his hits, including an exclusive unreleased track that has never been heard before. The ticket prices for both, SMAMUN delegates and outsiders will be available very soon. The distribution point for the tickets will also be disclosed soon. RSVP to this event page to stay updated with all details.